To some these places may not ring a bell. To others, they are part of growing up. 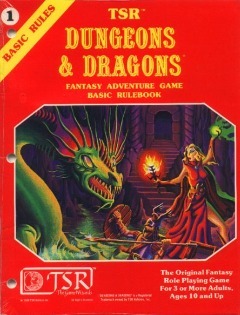 Growing up Dungeons & Dragons (D&D) caused a mix reaction to people. Some people thought it was the spawn of the devil, for others it was a world that allowed their imagination to grow. ​For me this was a place that influenced my imagination. It started when I received a red box that contained two things, a red book and a purple book. Within the red book, it had pcitures showing a world to explore. It was filled with information that contained different characters, spells, weapons, and monsters. The purple book describe a keep located on the Boarderlands. It talked about the Caves of Chos nearby that contained monsters to encounter. At first I just read through both of them, not understanding what to do with them. This was around 3rd or 4th grade. Then one day at school a firend told me about a game and started explaining it to me. Then I started to put two and two together and realized that I already owned the game. From that point until college I would play this game off and on. There were different people i played with, but many adventures. 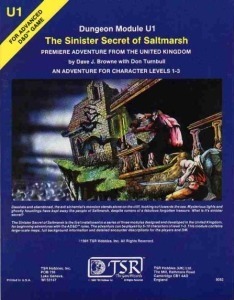 I went into the Ghost Tower of Inverness, traveled into White Plume Mountain looking for Blackrazor. There was another time I decended into the depths of the earth and explored a downed UFO in the Barrier Peaks. Even though I played it off and on, I started to collect a lot more rules, books, and modules. I would pick most of them up from Paradise Valley Mall. First at Toys by Roy then at Hobby Bench. 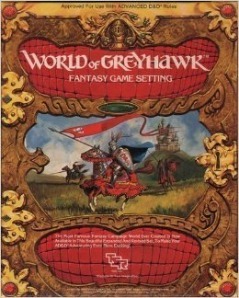 One of my purchases was the World of Greyhawk boxed set. This contain two books discussing the world of Oerth in which the Free City of Greyhawk was located. It also included a huge map where I located the sites of the modules I had collected. Here I located where the Slave Pits were, see the location of Saltmarsh, and create my own adventures that would take place in this world. During the course of the next years I would take them out and review them. Read more details or create places in my head. Once I was familar with Greyhawk, something new came out. Another friend took me to a place called Ravenloft, then through the campaign of Dragonlance. Other times we started to use the book Orient Adventures to introduce elements from Japan. Then there was the town of Lankhamar that was brought in as a playable adventure that was based on story outside of D&D. ​​At the heart of my travels they always took me back to Greyhawk. Even now in my mind I can bring these worlds back. But why this travel down memory lane? If you talk to anyone who has played D&D they can relate their own adventures and stories, but there is something more that people who have never played don't understand. It is storytelling. As the Dungeon Master (DM) you create a story that you tell others about. As they navigate through it, you can alter the story to adjust for their actions. 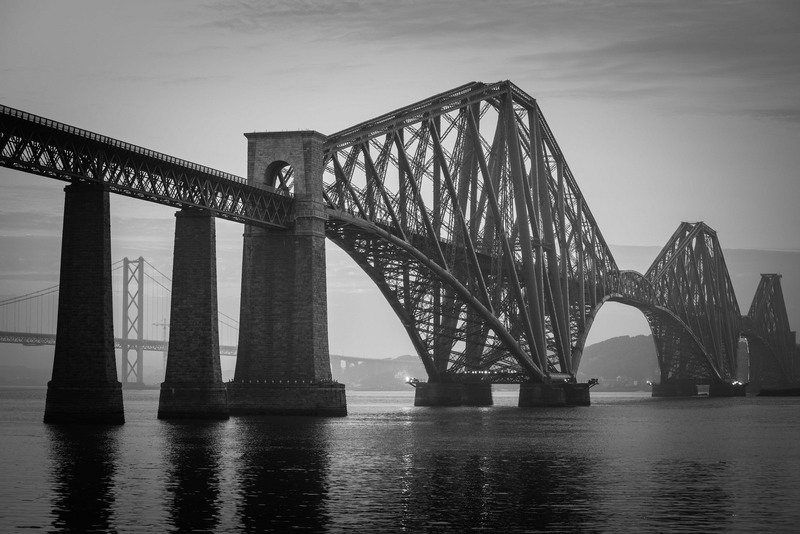 As a player, you can explore a story then make decisions that alter the outcome of it. The story grows and lives as it proceeds. At the heart of it D&D is involved storytelling. Now you might call me a geek, a nerd, or any other type of names you come up with because of how you remember D&D. That game played by the outcasts either in the corner of the playground, or the library. This does not bother me, because it is part of me. I think back to those adventures and the fun that was enjoyed playing them. A New Year, a new start? A few days ago I commented on Facebook that it is odd sensation when it comes to December 31st. Any other last day of month is treated as normal, nothing special. You might get paid the last day or the first day of the month. You might have work the next day, or you might not. However when it comes to December 31st it changes as it feels like a sense to start new, a reboot. Yet, perhaps we do need this psycological sensation to get us going. Make changes in our lives. For this 2014/2015 Christmas/New Year Holiday, With the office being closed more often, plus an extra day of vacation, It felt like this year it was definitly a chance a renewal. Now granted, this is not me making resolutions. I see it more of a renewal/restart on things. A recovery from the past few months. To get myself situated again and begin fresh. Though how do I use this mometum to continue for the rest of the year? That is where focus is needed. Granted not off to a good start, since I should be working on the checkbook instead of typing this. Still onwards and forwards. One part of this renewal I am going to focus on is trying to get more writing in. Part of that will be dependent on me scheduling how to spend my time. Perhaps by creating a schedule it is a resolution. No matter what it is called this past holiday break has been good time to start anew. It is a question of can I turn this into a momentum towards new things? We will just need to turn the page and find out. Here is to you having a good 2015. Recently we had to replace the CD player in our van. Little did I know that by doing this, I would have killed out need for CDs. My mix tapes still worked. Somehow the kids survived this dark age. At Christmas we went and purchased a replcaement CD player. We made sure that it could read our MP3 CDs. So we kept an eye for the packaging saying reads MP3. We found one that looked good, it was also on sale, and proceeded to buy it. Now I set someone aside over time for us to have it installed. Yesterday was the installation. Everything went by fine, it took less than an hour to install. We looked at it, saw it was working, looking good, except for one thing. No CD Player. When we focused on looknig for a CD Player that would play MP3s, we focused on the MP3 part, not the CD part. So now we had a JVC Media Center in our van. It would stram Pandora from the phone, but what else? There was a USB slot. Simply solution, take our MP3s, place them on a USB stick and there we go. All I had to do was burn our CDs to MP3 format. But wait, I could do that with our existing CDs, but what about new CDs? This is where is I killed our Need for CDs. We have never been Apple people, so I have been using Amazon to buy our music. They offer them in DRM free MP3 files. From this point onwards, I would not need to buy a CD if I can get it from Amazon. We were planning on buying the Frozen soundtrack for the kids. But when I started to think about this, I just walked out with a mini USB stick and bought only the songs we wanted from Amazon. Since then I have been working on adding to the USB Stick. Looking back on this simple mistake, I have now seen three different media formats killed. Firs there was the short lived 8-Track player in my mom's old Mustang. Then cassettes were the rule for years. Slowly, in the 90's CDs starting to becom the de-facto with making mix tapes from the CDs. Now we hit where MP3s are the defacto, with CDs being the back up. I have the equivlant of 30 CDs on the USB stick and have not even hit 25% of used space yet on it. It will be interesting to see what the final 'CD' count is on the USB stick. Granted, chances are we will still purchase CDs, some of them might not be available on Amazon. Like the Bill & Ted's Excellent Adventure Soundtrack. But now we have made a change in our habits. In one simple mistake, we have removed our need for CDs, thus another media format has bitten the dust. For the past few weeks we have been re-watching The Legend of Kora. If you are not familiar with it, it is the follow up to Avatar: The Last Airbender. In Book 1 one of the series (each season is called a Book), the main villain is Amon. During the original airing, when you had to wait a week for each episode you thought, how will this turn out. Watching it a second time, you are still gripped by what is happening even though you know the ending. My son Gabe was still nervous watching the show a 2nd time, because how much it gripped him. He asked why are the good villains in movies only. This started me to think about what other villains were memorable and kept you gripped during a book, TV show, or a movie. I think this is a hard question because everyone will have a list of who is the best villain. Just do a Google search and you can see how many lists come up. There are famous villains and memorable. Famous villains are ones that everyone knows. Memorable ones are those who remain strong and live up to their names. When I started writing this I was trying to think of villains that start strong and remain strong till the end. There are some that I thought, they are great, but then realized they had faults. One example is the Borg in Star Trek. Great the first two times they appeared, then they lost their edge. Here are some selected villains that I feel are memorable and try to explain why I feel they are memorable. 1) Amon (The Legend of Kora): I am starting with Amon, since he was the reason for this post. When you watch the series, Amon is not out in front, he is slowly brought in. As he is brought into the story, you start to see the danger he poses to Republic City and the benders. Each episode adds a layer to him, until the final few episodes when you wonder how will he be stopped. His character never becomes weak or water downed, he is strong until the end. One other item I liked he is given a chance to do something Avatar Korra early on, but he does not. Granted you can't kill the hero, but it is written in a way that feels natural, and builds more upon his grand scheme. 2) Hans Gruber (Die Hard): There times when a villain does not have to extend over different stories, you can have a strong villain in a self contained story. Hans Grueber is one of the best for a one off villain. I will say that Alan Rickman's performance is most of the reason why. Here you have a villain with plan, then it starts to go wrong due to an unforeseen element. He never looses control. and is willing to take matters into his own hands. The scene with him and Takagi shows him being straight forward on what he wants and willing to get his hands bloodied. 3) Hannibal Lecter (Silence of the Lambs): This is an example of Villain who is great, but I feel is watered down over time. I tried to avoid choosing someone like this, but you can just watch Silence to see how great his is. Without a doubt, Silence of the Lambs sets up Lecter as the perfect brilliant villain, who has his own goal. He is able to use others to achieve what he wants, without them knowing it. I had read the book, and thought it was good, the movie adds upon this with Anthony Hopkins acting skills, which is why he deserved the Oscar for it. The only other book/film in the series I thought was decent was Red Dragon. Currently if you say Hannibal Lecter, it is Silence that you remember. 4) Grand Admiral Thrwan (Heir to the Empire; Dark Force Rising; The Last Command): A lot of people might say who. Unless you are into Star Wars, it won't know who he is. If you say, was he in the movies, the answer is no. Back in 1991 when Bantam decided to release new stories set nine years after the last movie, a villain was needed. Thrawn was the villain. He was a brilliant tactician who was trying to restore the Empire. During the course of the Thrawn Trilogy he was one step ahead of the heroes. Timothy Zhan who wrote the books, had created a strong enemy who knew when to cut out when there was no victory. How The Last Command ended I thought at the time was a cop-out. When looking back, in a way it was the only logical way to defeat this master mind. Last week I watched a movie called Dreams of a Life [Netflix]. It was the story of Joyce Vincent. Her body was found in her apartment 3 years after she had died. The TV was still on during this time. I found this documentary haunting because you wonder how could something like this could happen. The document tries to answer that question by interviewing the people who knew her. The downside to the documentary is that her family is not interviewed which leaves more unanswered questions. I would hope that if someone is in trouble or needs help there is at least one person they can reach out to. I know this is not the case, since you hear about the stories of those who reflect back on someone who was murdered in an abusive relationship or committed suicide. This case is different because the person is gone for three years and no on notices her gone. How can this happen in our society today? Near the end, they were talking with co-workers of Joyce who said they heard different things on why she was leaving work. How many co-workers have left where you work, and you never hear about them again? I have seen a lot of people leave the company I work for, but because of this story, my thoughts went back to a girl who use to work for me, Anastasia Mikulak. She worked for me for a short time, probably 1998 to 1999, or even just for 1999. She was still in her early 20's and this was her first office job. She was a good worker, but still needed some help with understanding working in an office. One day she did not show up for work. When she did not report to work, at first I was upset, since I could not understand where she was. After a few hours it switched to concern, since no one had heard from her. Then another employee in the department informed me that she had received word from Anastasia that she had been in a fight with her husband the night before. The co-worker was also young, and was not sure how to report this issue. Eventually we found out her husband had severely beat her that night and she fled back to California to be with her family. Her husband was still at their place and did not pick up the phone during the numerous times we were calling it. He thought it was her calling him and he did not want to speak to her. She never came back to the office to work, or collect her personal items. We boxed them up and shipped them back to California. The last we heard was from her mom that she was not coming back. I started to think about her, because other than the one number we had for her, there was no other way for us to get in touch with her. If her husband had beaten her to death, we probably would have had a visit from the police. Even then, we would not have been able to shed much light on her. The only thing we knew about her husband was from what she told us about him. From those stories he sounded like a jerk, but no hint of abuse going on. For Anastasia, the only person she could turn to was her mother, in another state. Anastasia was upset that the co-worker told us about the fight and did not talk to her again. In the end we hoped that things would improve for her. To this day I have never heard from her. Looking back on Anastasia and Joyce, if the individual cannot turn to someone, or does not want to, how can one help them? Deep down we do want to help others, and people will step up to help someone in danger. What we need to keep in mind is that it is still a matter of knowing someone in life so that we are not forgotten.